The only resolution I made for 2018 was to distinguish between the work I do for love – my own writing, and the work I do for money – word-smithing for businesses. Distinctions bring clarity. And clarity enables us to be creative, productive and to attract opportunities effortlessly. One of my most favourite books is A Room with A View by E M Forster in which he champions love and truth over social niceties. Without the honest appraisal of what we truly love we will forever be “in a muddle” – and therefore less effective in our efforts. Giving more focus to the things we love rather than the things we do out of obligation imbues us with clarity and power. So it’s worth being honest with ourselves and making the distinction. As a result my writing spark is back with a vengeance. I’m having fun writing my blog and new business enquiries are arriving at my door. Before I was muddled in my thinking about writing – so my focus and energy were confused and dissipated. I was perhaps falling for the assumption that having more things to focus on would rob me of time. Rather having sharper focus on more distinct things feels like I have generated more time, and infinitely more ideas. Inspiration and words are flowing; and my skills are in demand. The Journal Writer’s Handbook contains an exercise called Lists of Distinction, encouraging you to distinguish between your talents, gifts, skills and interests. Sharpening your focus on each throws up more clarity, more possibility and more choice about the things that lead you to a greater sense of creativity, fulfillment and joy. Don’t be muddled. Be distinctive. Make your own distinctions. I have often found it a lot of effort to motivate myself. I usually manage it – but it often leaves me feeling tired, and unlikely to want to repeat the effort any time soon. So I was delighted to hear Abraham Hicks’ insistence that there is more joyful productivity likely when we are moved by inspiration rather than motivation. This was music to my ears. For years I have periodically asserted that I like to “follow my nose” in my projects, commercial or creative. I usually prefer to see where the mood takes me, rather than slavishly follow a pattern or plan, which quickly has me restless and bored. To me, this is all about being guided by inspiration rather than force. It feels like gliding rather than trudging through life. This way of proceeding can prove chaotic, indecisive and messy to the casual observer. It might seem flakey, unreliable and weird. Of course that would be a problem if I were here to live life according to someone else’s agenda. But since I’m not here to do that, following my nose, or my heart, or my bliss, makes things much more fun and spontaneous moment to moment. It means I get to choose the impulse that feels the best to me, and follow that to its conclusion. It also feels less like I’m pushing things uphill, and more like I’m free-wheeling down the other side of a hill I’ve climbed through courage and vision and honesty rather than effort and obligation and pressure. I have had a great deal of really cool experiences with this approach. It helps me be more ready to say YES to opportunities as they present themselves. And it has also opened the flood gates to a whole host of new creative ideas. If you are looking for ways to tap into your creative imagination, or if you are keen to live the life you want, you would do worse than to give yourself permission to explore what impulses occur to you, moment to moment, when you allow yourself off the motivation hook and get ready to be inspired. It’s always a huge privilege to talk to artists about their work. I find it brings their creations to life for me in a way I don’t know that I’d get just by viewing their work in a gallery. I love to understand their process, the questions they begin with, the choices they make and how these present themselves. Creating art is vital to our humanity, though often in our utilitarian, materialistic worldview it is more convenient, or more practical, to believe otherwise. However I am a fan of art and artists. As a journal writer I like to reflect on what art has given me whenever I have encountered it. A couple of weeks ago I enjoyed a fabulous conversation with Swindon-based multi-media artist Jill Carter. Her collection Curious Narratives contains drawings, found items, photographs, stitched dolls, journals and items to wear, chronicling her time travelling in Italy, in search of the mythical Sybils, the prophetic women of the Classical world. 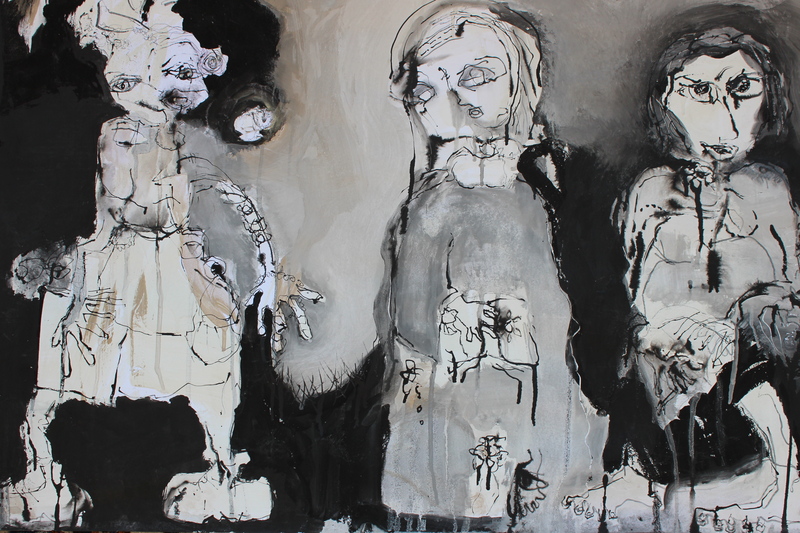 Jill’s Sybils, depicted here in pen and ink, are left to right a doll, a healer and a donor. It feels like these are symbols of her process and motivation. I am intrigued by what dolls, and stitching, mean to Jill. Both are central to her work. Jill tells me that dolls signify our childlike creativity and expression, but she also considers them to be the story keepers, representing ritual and spiritual healing, like religious icons. After working in social settings Jill describes feeling overwhelmed by people’s stories and how she felt herself being drawn to stitching dolls. I wonder whether this is about containment, holding in that which we cannot process or resolve. It’s like praying, transferring our pain onto an inanimate approximation of ourselves, in the hope of transformation. And the thought occurs to me that this could be why some people find dolls creepy – the artificial, frozen features are the repositories of unidentified fear and suffering. After the stitching comes the healing. This feels like integration, and is akin for me to journaling. Once we are healed, once we have that clarity, then we can give. It is a metamorphosis of sorts. Where are you on the journey from stitching to giving? How does your journal and your process help you heal? Vulnerability is a personal hot potato for me at the moment. It is also the topic of one of my prompts being used by the international journaling community in the 30 day digital journaling challenge. So I was fascinated by the new series on Channel 4 featuring Grayson Perry’s quest to find the real identities of people, famous and not so, vulnerable and not so, and to represent these artistically. In the first programme Perry was spending time with people who are grappling with their identities in transition. He spoke to a young British single Mum who has recently converted to Islam; to Rylan, the winner of celebrity Big Brother, who is embarking on fame as a career; and to Jaz, a black, British 24 year old who is navigating the waters of gender change and is trying to establish his identity as a man. These are all places where we can feel at our most vulnerable, stepping into experiences previously unknown to us, but which compel us anyway. However it was Perry’s interview with disgraced politician Chris Huhne which was the most uncomfortable, and revealing. The question was Who are you? And despite the fact that Huhne comes across as thick-skinned and resilient as a rubber doll, Perry was determined to find the chinks in his armour. Perhaps this is a flaw in the artist, preferring to project onto his subject what he hopes to find, rather than representing him as he is. Or perhaps it is artistic genius to show our truth despite ourselves. 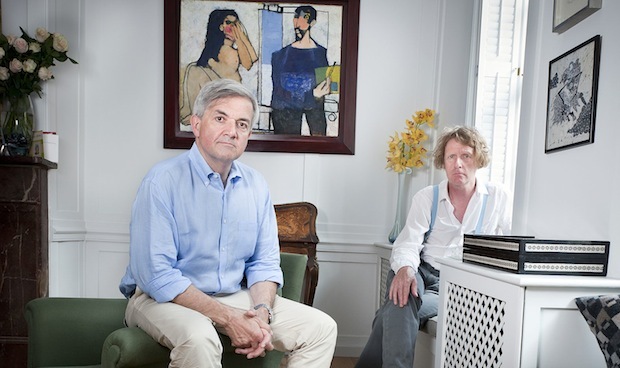 Nonetheless, instead of a rubberised doll with Chris Huhne’s face, Perry created a pot – an appropriate ’empty vessel’ as James Delingpole would have it – decorated with Warhol-esque repetitions of Huhne’s face and car registration plate, along with repeating images of penises. Perry then took a hammer to the pot, smashing it into numerous pieces, before gluing it back together and highlighting the cracks with gold leaf. The symbolism being that it is our human flaws, our vulnerabilities, which make us most precious and interesting. It can be tempting to present a rubberised version of ourselves to the world. But this wouldn’t be human. Nor would it be true. Our vulnerabilities are worth exploring. They are where our treasure lies. Journaling is a safe way to explore them, and as Grayson Perry identified, they are worth their weight in gold. Only 2 hours to go from right now before I begin speaking at Swindon Philo – and sharing my admiration and excitement about the extraordinary British polymath, writer, artist, and psychoanalyst Marion Milner 1900 – 1998. 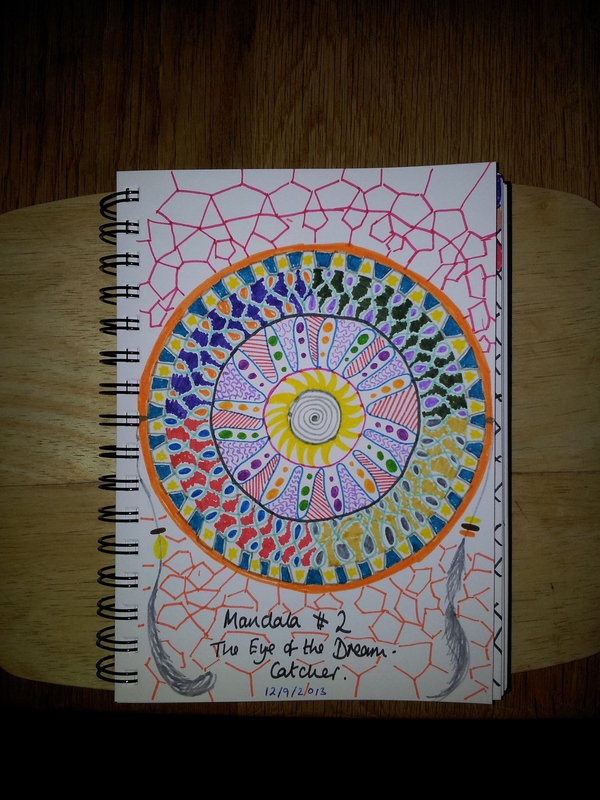 And then I read a blog post by inlovewithjournals, who’s also just started to dabble with mandalas. I feel in good company. I’ve written about Bowie before on this blog, and I make no apology for doing so again. 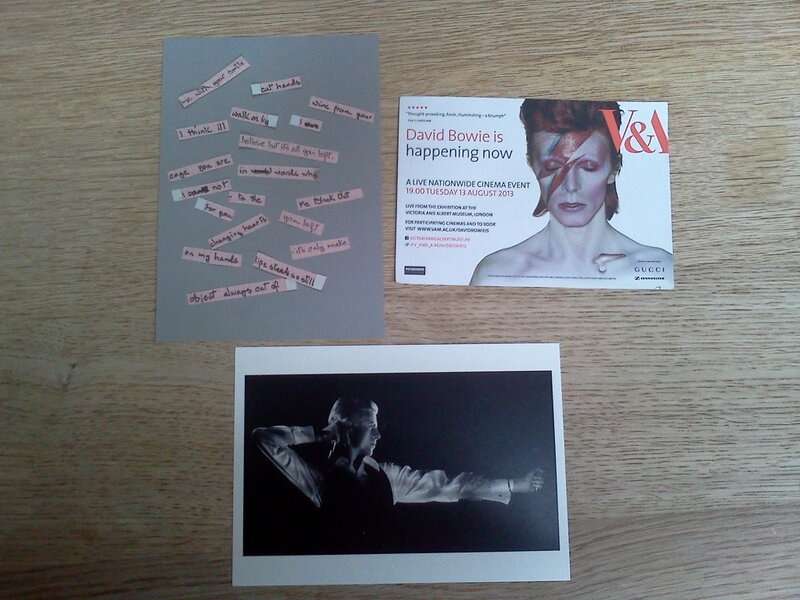 For precisely one week ago I visited the David Bowie is exhibition at London’s V&A and was once again transported by his words and music. The things that most stand out for me from this exciting showcase of Bowie’s work through sound, video, personal diaries, notes and costume, is the musician’s constant assertion that there is no authorial voice in his creations. Major Tom, Ziggy Stardust, Aladdin Sane, the Thin White Duke and other of his performance personae seem deliberately to negate the identity of the performer. And looking at his most recent album cover there is no image at all of Bowie, just a plain white square over the photo. There is something important in this negation of the authorial voice. Something which gives greater life and vibrancy to the musical and artistic creation perhaps. Or which simply causes the fans to scream more loudly, so difficult to tolerate is the idea that the person performing is simply a beautiful and tantalising illusion. The next important thing is Bowie’s approach to song-writing, his chopping up of words and phrases and random rearrangement of them, or his ability to capture lyrics in their entirety, in one take on the page, so the words we read are the words we hear. Surrealist chance or surreal imagination? A combination of the two. Self-negation, illusion, chance and imagination. A potent mix. A vibrant creative recipe.